AMMONNEWS - His Majesty King Abdullah II met in Tokyo on Monday with President of the Japan International Cooperation Agency (JICA) Shinichi Kitaoka, who affirmed that JICA will encourage Japanese companies as well as Small and Medium-sized Enterprises ( SME's) that operate in the fields of energy and entrepreneurship, to invest in the Kingdom. Kitaoka added in a press interview after the meeting, that the agency will encourage these companies and corporations to set up projects in Jordan, as there are many promising areas to invest in, and due to the great opportunities available in the tourism and SME's sectors. His Majesty's meeting with the JICA president is part of a series of meetings between His Majesty and a number of senior officials in Japan to discuss the possibility of enhancing cooperation between Jordan and Japan in various sectors to support the Jordanian economy, develop public services and infrastructure and provide jobs for Jordanians. The King expressed his appreciation for the financial and technical support provided by the Agency to Jordan's economic and development plans, as well as in the fields of vocational training, agriculture and other programs aimed at developing the capabilities of Jordanians. His Majesty pointed to the importance of the development policy loan that will presented by the Japanese government to Jordan. During the meeting, which also dealt with the conference that will be hosted by Britain early next year to support the economy and investment in Jordan, His Majesty expressed his hope that Japanese corporations and companies will take part in the conference. The JICA president praised the strong relations between Jordan and Japan that are based on mutual confidence and are an outcome of the strong ties between the two sides and a long history of joint cooperation. 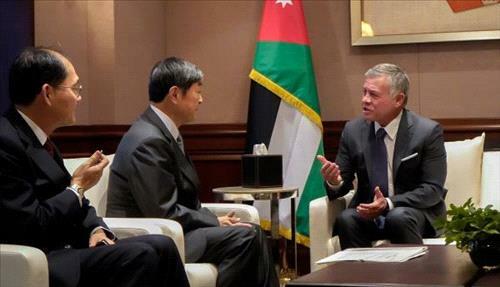 Japan, he said, was one of the first countries that pledged to assist Jordan in implementing its development plans and programs. Kitaoka added that the Agency is also interested in supporting efforts to preserve the ancient city of Petra and develop the city's infrastructure to enable it to attract more tourists. He also highlighted JICA's efforts to provide support to refugees in Jordan, especially in the area of vocational training. The meeting was attended by the King's advisor, the director of the King's office, the minister of planning and international cooperation, the Jordanian charge d'affaires in Amman and Japan's ambassador to Jordan.